The college football season is in full swing, as we are now into the eleventh week of a full slate of games. As long as you’re taking in some of the action, here are some players who could make sense for the Philadelphia Eagles in the 2019 NFL Draft, in which the Birds are projected to have 10 picks. 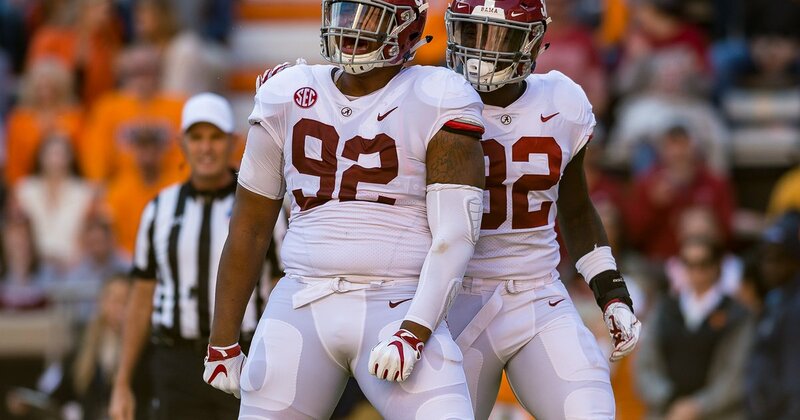 Quinnen Williams, DT, Alabama (6’4, 289): (18) Mississippi State at (1) Alabama, 3:30 p.m.
Williams wasn’t an elite prospect when the 2018 season began, but he has played himself into early first round consideration. While he hasn’t piled up crazy stats, he has produced all season, and last week against LSU, he had something of breakout game in which many are beginning to notice him. At 6’4, 289, he’s not the biggest defensive tackle prospect in this draft class, but he very well may be the best run stuffer, and he has ability as a pass rusher as well. Personally, I don’t think he’ll be around whenever the Eagles are picking, but if he is, he’s an obvious fit in Jim Schwartz’s defense. Mack Wilson, LB, Alabama (6’2, 239): (18) Mississippi State at (1) Alabama, 3:30 p.m.
Alabama has had inside linebackers selected early in each of the last three drafts. Reggie Ragland went 41st overall in 2016, Reuben Foster slid to 31st in 2017, and Rashaan Evans went 21st in 2018. As such, like with other positions in Bama’s defense, younger players have to wait their turn to get on the field. As a freshman in 2016, Wilson’s impact was mainly felt on special teams, where he produced a lot of big hits on kick coverage. When he got his chance to start in 2017, he responded by intercepting 4 passes. In 2018, he has 2 picks, and is an enforcer in the middle of that Bama’s imposing defense. The Eagles don’t value the linebacker position early in the draft, but it’s noteworthy that Jordan Hicks is slated to become a free agent this offseason. If Wilson were to slide into the second round somehow, I could see the Birds having interest there if Hicks moves on to another team. Deionte Thompson, S, Alabama (6’2, 196): (18) Mississippi State at (1) Alabama, 3:30 p.m.
Thompson could be a plug-and-play starter in the Rodney McLeod role. Zach Allen, DE/DT, Boston College (6’5, 285): (2) Clemson at (17) Boston College, 8:00 p.m.
At 6’5, 285, Allen isn’t going to be mistaken for a speed rusher like Von Miller, but he offers inside-outside versatility and has the ability to push the pocket with his sheer strength. Over the last three seasons, he has 38 tackles for loss and 15.5 sacks. The Eagles will be in need of depth both at defensive end and defensive tackle, and Allen is a player who can play either position. Preston Williams, WR, Colorado State (6’4, 210): Colorado State at Nevada, 10:30 p.m.
Coming out of high school, Williams was a highly sought after prospect who enrolled at Tennessee, but had a major knee injury his senior year in high school. After two disappointing seasons with the Vols, he transferred to Colorado State, where he was arrested, and subsequently suspended by CSU (even though he couldn’t play during the 2017 season as a transfer anyway). There are character concerns, but Williams is a receiver with great size and down-the-field ability whose skill set should interest the Eagles.